CSMs must be mounted on a table of some sort. We took a stool (purchased from WalMart), removed the seat and mounted a big cherry board. A custom notch was sawed out to accommodate the machine snugly. We tried to mount the machine over the stool's center so it wouldn't tip over. In June 2005 we attended a CSMSA convention at the Valley Plaza Inn (Best Western) in Midland, Michigan. Elizabeth took her LeGare and Jim took a basket-case Gearhart. 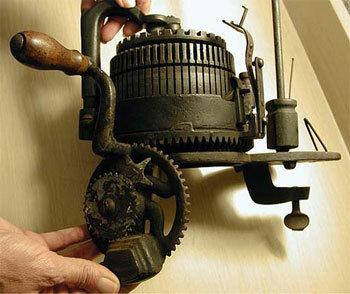 With the help of Pete Olson, a complete set of needles, some scrubbing and machine oil, and fine tuning, Jim's machine was made operational except for the ribber which was broken in the process of trying to free it. 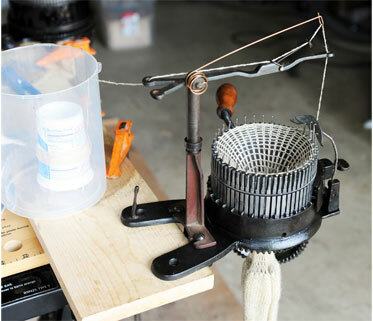 (The machine will make a sock with out the ribber, and the needles for the ribber are no longer available anyway.) These pictures are of Jim and Elizabeth at that convention. 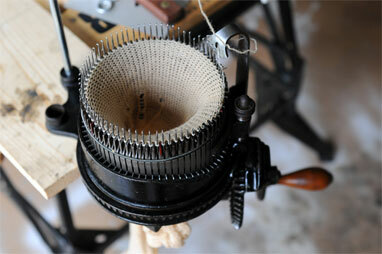 Circular Sock Machines or CSMs can be very temperamental and must be adjusted perfectly for uniform knitting. 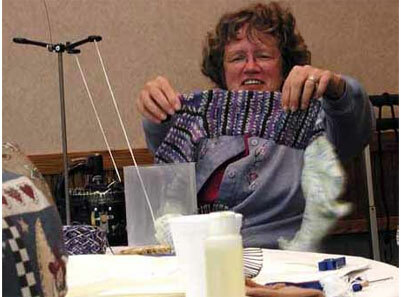 The Internet has several mailing lists and the CSMSA (Circular Sock Machine Society of America) holds a yearly convention. 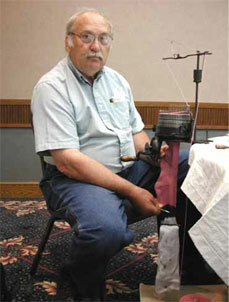 Yes, Jim can make a heel but has not mastered closing of the toe at this stage. Our sock drawers are not filled with a full collection of hand-cranked socks as of yet. 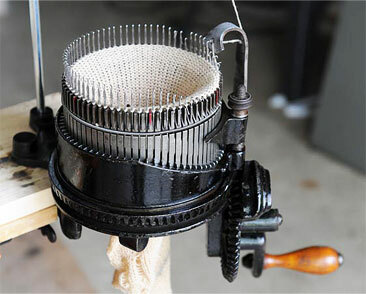 If you would like a pair of hand-cranked socks, a Google search should provide a number of folks who have second jobs turning out socks on these machines. The nice thing about this machine is you can see how it works. 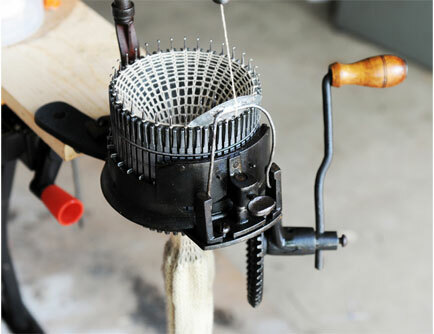 As the cylinder rotates and carries with it the needles, they can be observed rising to grab the yarn and then falling to form a loop. In this setup, every other needle has been romoved. 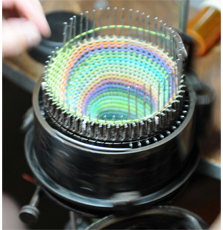 Another knitted pattern formed on a CSM. 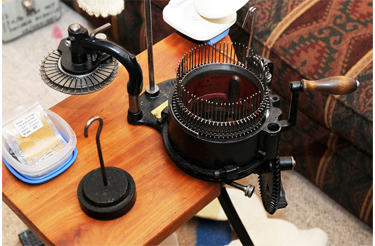 Some of our machines come with cylinders having various numbers of needles. 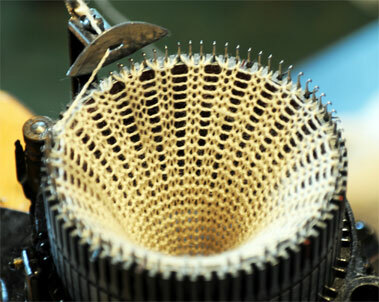 This cylinder has many needles as can be seen by the tightness of the weave.